The measure goes into effect Jan. 1, 2012, however many of the state’s local governments have already enacted measures that prohibit phosphorus fertilizers. Ann Arbor prohibited phosphorus based fertilizers in 2007 and has recorded a 30 percent drop in phosphorus levels in the Huron River. Farms, golf courses, and new residential lawns are excluded from the ban, however the Michigan Department of Agriculture plans to work with these entities to reduce their phosphorus use as well. Recent legislation from 15 states, including Michigan, has also required that manufactures drop phosphorus from dishwasher detergent. 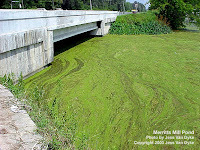 This comes decades after bans on phosphorus in laundry detergent that helped to reduce algae bloom in the Great Lakes. It’s always good to see a step in the right direction!